I have always loved pictures that show the bond, the feelings between a human and an animal. 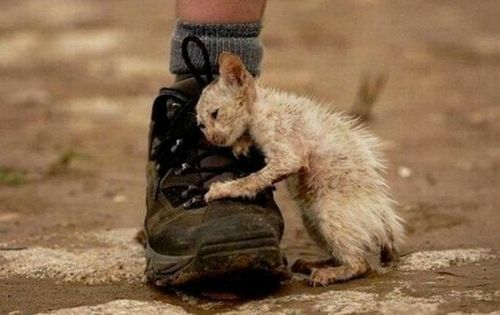 This time, I'm sharing with ya'll again (whoever is reading this) of a picture that deeply touched my heart and makes me feel like crying and how I wish I could be there to help this little kitten. It feels like the kitten is relying on the person that the kitten lay it's head onto. It's as if the kitten is asking for mercy, for love, for compassion from that person. The kitten looks so miserable, so left-out, that it looks like he's been struggling to live..
And all he's asking is just...love. This picture is deep. Like reallllllly deep. I just hope that whoever sees that kitten will have some mercy to at least, give this lil kitten some food. Or better yet, take good care of it. May God repay you for your kindness. It makes me wonder what was the person's reaction. I hope the person is nice enough to take care of the cat,at least,feed it.